The pink cherry tree blossomed in the springtime. It's fragrance filled the air of Curtis Park in downtown Denver. Curtis Park is north of downtown Denver, and is a mix of young couples, African-Americans, children and seniors. This young couple in their 20’s wanted to do portraits in Curtis Park since this was where they lived. They wanted to celebrate their wedding anniversary by capturing this time in their life. We met at their home in the late afternoon, and walked from their apartment to the park, stopping along the way to photograph them. Curtis Park has a real diversity of texture and color. Although some things were just starting to bloom, most trees and plants were still brown, this beautiful pink tree really caught my eye. I found this tree, and wanted to use it artistically in a portrait of them. I asked them to kiss, and photographed them close up. Then I stepped back and placed them in the corner. This made the image much more interesting compositionally. The park was full of people, kids playing and running around. I definitely wanted to make sure the couple looked alone in the photograph. It helped to create a sense of intimacy. Even though several years have passed since making this image, I still really love it. 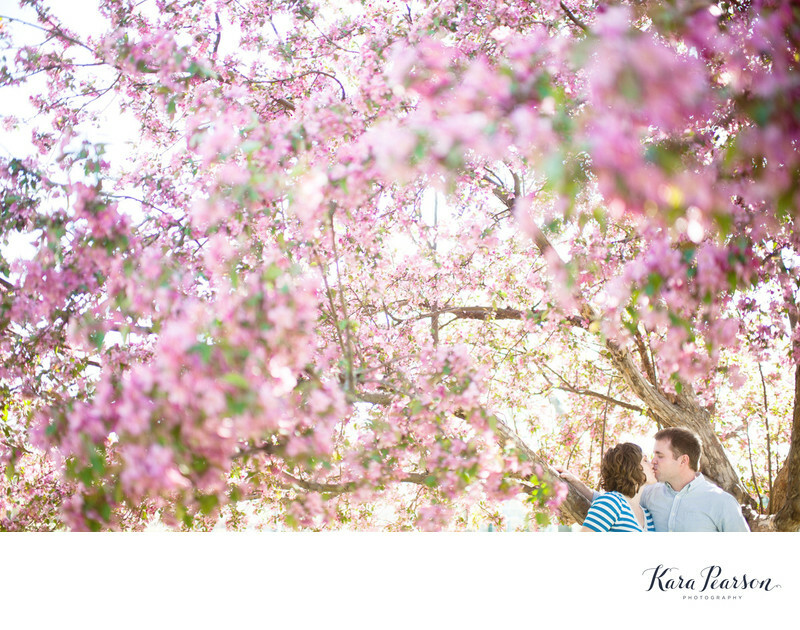 I feel the warm sun, smell the blossoms and just remember truly enjoying capturing a couple’s love. I used a 50mm f/1.4 lens on a Nikon D700 digital camera. Location: 3100 Curtis St. Denver, CO 80205.